Dapple is the first music offering from our Android division. Touch and draw colorful, sweeping musical soundscapes. Have fun creating swirling waves and sprawling layers of sound. Create something original with every tap and swipe. 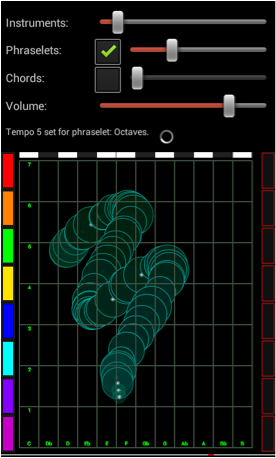 Dapple is a different kind of musical instrument, with several musically experimental ideas at work all in the small space of your smartphone or tablet. - Access over one hundred instruments. - Play over a range of seven octaves. - Select musical timbres from the color palette. - Swipe to create elongated patterns of sound. - Tap to play a short phrase or "phraselet". - Vary the tempo using red tempo blocks. - Tilt to move sounds in stereo from left to right. - Play from collections of tempos, chords, and phraselets. Your sounds will flow in stereo with headphones as you tilt the screen left and right. Dapple will quickly have you searching for even more indescribable sounds and musical patterns. Is it art? Is it music? We're not sure, but it sure is a fun instrument to play. We're just getting started...please post your suggestions and ideas. Devices with larger screens supporting pressure-sensitive touch and orientation sensing, and listening with a good pair of headphones will give the best results.